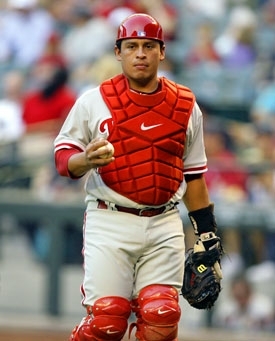 Someone I know recently had a dream Carlos Ruiz was hitting on her at close range in a diner booth. He asked her to refer to him as “El Gato.” Unfortunately for her, she woke up. Ruiz won’t ever be confused with “the Big Cat” Andres Galarraga— Ruiz is Panamanian, Galarraga was Venezuelan; Ruiz has 24 career HR, Galarraga ended his career with 399 (one more than ex-Phil Dale Murphy, by the way)– but he’s currently hitting .288/.394/.404 in 208 AB, a career high in OBP by almost 40 points thanks to 35 walks (6 of them intentional). Shockingly, Ruiz would beat Darren Daulton (best single season: .392 in 1993, when he hit 24 HR with 117 walks and finished 7th in MVP voting). Also trailing the Chooch Train: Bob Boone (.367 in 1979) and Mike Lieberthal (.373 in 2003). Speaking of catchers, Bob Uecker as a Phillie, from 1966-1967: .202/.278/.322 with 7 HR in 242 AB– half of his 14 career HR. This entry was posted on August 1, 2010 at 2:14 pm and is filed under 2010 Phillies. You can follow any responses to this entry through the RSS 2.0 feed. You can leave a response, or trackback from your own site.